The Eastern Daily Press has been revealed as the fastest growing regional newspaper on both Facebook and Twitter in the latest ABC Figures. ABC has published six-monthly figures for regional press social media accounts for the first time, with the Norwich-based Archant title scoring the biggest year-on-year increase for Facebook ‘likes’ and Twitter ‘followers’. Data was submitted to the auditor by regional publishers Archant, Baylis Media, the KM Group and the Midland News Association covering its titles’ social media performances. Figures from Trinity Mirror, which already submits Facebook and Twitter reports to ABC on a monthly basis, were also included. The Twitter figures saw multiple accounts run by the same newspaper reported separately. For example, figures for the EDP’s main EDP24 account were published separately from the independent accounts it runs for business and sports news. 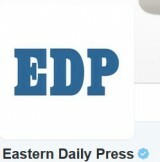 The EDP’s success in growing its social media audience was tempered by a 5.5pc fall in its print circulation, as reported here. Sorry but did I miss the story about social media followers becoming bill paying currency in the regional press these days? How do “likes” and “followers” equate to actual real time revenue for Archant ? And will these free to click ‘increases’ offset the latest in a long line of copy sale losses, this time a further 5.5% on the print side of the EDP? £100 will get you more followers than the Coventry Telegraph. They will be spammy ‘fakes’ and wont engage, but that is not what is being measured is it? Facebook Likes, especially, are almost too easy to get. I expect I’ve Liked the EDP on FB at some stage, because I used to work there, and am therefore counted among those 30,000 – but that doesn’t mean I ever engage with the brand on Facebook any more. So, while a lot of them and a rapid growth rate are obviously preferable to a stagnant low figure, they’re really not very meaningful. It is certainly possible to construct metrics that would give a better indication of real audience interaction with the brand on social media, of the kind that one day might translate into revenue – for example, retweets on Twitter, or likes, shares and comments for individual Facebook posts. But the trouble is nobody yet knows exactly what to measure on social because they don’t know exactly what its point is! IT DOESN’T PAY THE BILLS. I can’t be any clearer. My personal FB page has lots of likes, but no-one throws money at me. You can ‘buy’ FB likes and Twitter followers – you could have a million of each. But there is no revenue on either. Doh! Well done Archant on successfully getting people to like your news stories and helping them get the news for free, now if you can just work on getting both the readerships of all your daily and weekly titles up and start monetising the Twitter and Facebook traffic we will all be suitably impressed. Free followers and likes unfortunately don’t pay the overheads and yet another round of huge ABC readership losses for all daily and weekly titles should be more of a concern and of more of a priority than meaningless social media clicks. Did a rough analysis of number of likes for my posts just on FB over last week and got someone to chose a random friend of mine. Added the two together and got the average. Only only six papers beat us – and they are daily papers. And we are double the “fastest growing” paper. And no followers bought either. And all revealed just as Facebook adds several other comment possibilities to posts…. mrs Bragsnza is a cake maker and the number of people looking in her cake shop window has trebled in the last six months and the number of people coming into the shop and taking her cakes off the shelves for free has also dramatically increased which is great news! She was also ‘followed’ by six people last Thursday as they wanted to look at her cakes with a view to seeing what was on offer ahead of popping in and taking a few off the shelves on their way home. Although Facebook Likes and Twitter Followers do not pay the bills, publishers make money from the ads that are sold on the articles they publish. Therefore if you grow your likes / followers and a consistent percentage of people then click through the articles that are posted on these platforms this equates to a higher revenue. So they may not directly mean greater revenue but indirectly they may encourage someone to read an article or more. Let’s be honest James, it’s not likely at all is it? And any money made from this will be hardly enough to pay the coffee bill at one of the managers weekly meetings.